Annie can be heard on the Allégresse recordings, Allégresse: Music for Flute, Oboe, and Piano (2009), Fresh Ink (2010), and (Mercury 2016). The trio’s most recent project, a work entitled Gorgeous Nothings, can be heard on the Navona recording of music written by composer Ingrid Stolzel. The recording, also entitled Gorgeous Nothings, is set to be released July of 2018. Annie has also performed the music of Brian Kip Haaheim on the soundtrack to the Showtime documentary film Fall From Grace and is the principal flutist on the 2006 Naxos Release of Redline Tango with the University of Kansas Wind Ensemble. In the summers, Annie is the flute instructor at The University of Kansas Mid-Western Music Camp and the Forth Hay State University High Plains Band Camp. She performs frequently on Kansas Public Radio both with Allégresse and as a soloist. 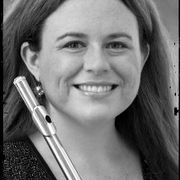 Annie is the principal flutist in the Lawrence Chamber Orchestra and holds both a bachelor’s and master’s degree in flute performance at the University of Kansas where she studied with John Boulton and David Fedele.